Global stocks shake off Italy vote; oil moves higher. U.S. indexes are moving higher in early trading, boosted by resilience in European equities after Italians voted down the country’s constitutional referendum on Sunday; rising WTI crude oil prices are also lending support. This comes after the S&P 500 failed to hold early gains in Friday’s session, as strength in defensive stocks was not enough to overcome weakness in the heavily weighted financials and consumer discretionary sectors. Overseas, Asian markets finished mostly lower; the Shanghai Composite (-1.2%) and the Hang Seng (-0.2%) both declined, whereas Japan’s Nikkei (-0.8%) took a breather after reaching 11-month highs last week. Stocks in Europe recovered from early selling pressure following Sunday’s vote in Italy; the STOXX 600 is up 0.4% mid-afternoon. Elsewhere, oil ($51.88/barrel) is tracking near 12-month highs on optimism around last week’s Organization of the Petroleum Exporting Countries (OPEC) deal, COMEX gold ($1163/oz.) is off 1.24%, and Treasuries are falling as the yield on the 10-year note trades at 2.44%. Quiet week ahead for data as investors mull election results in Europe. As is typically the case in the week after the release of the U.S. monthly jobs report, released last Friday, December 2, 2016, this week’s U.S. economic calendar is relatively quiet, with today’s key release being the service sector Institute for Supply Management (ISM) reading for November. After a flurry of Federal Reserve Bank (Fed) speakers today, December 5, the unofficial “quiet period” for the Fed begins, ahead of the December 13-14, 2016 Federal Open Market Committee (FOMC) meeting. Overseas, China will begin to report its November data set this week, and the central banks of Canada, Australia, and India all meet. With the Italian referendum and the Austrian election in the rear-view mirror, the key event in Europe this week is the European Central Bank‘s policy meeting on Thursday, December 8. European equity markets, and the euro itself, are positive after yesterday’s voting. As widely expected, the Italian people voted against a referendum that would restructure how the country’s Senate would be elected, leading to the resignation of Prime Minister Matteo Renzi. His resignation opens the door for the anti-European Five Star party to gain political strength, and perhaps even lead the next Italian government. Although this is potentially destabilizing, the markets had well priced in the outcome of this vote. At the same time, Austrian voters rejected an anti-European candidate from the far right as their president. Though the presidency in Austria is relatively weak, the election of a far-right candidate would have been seen as another threat to European political integration and the euro itself. This positive surprise has helped the markets (outside of Italian stocks) remain buoyant. Beige Book recap. The themes in the November 2016 Beige Book are consistent with our view that the Fed will raise rates later this month. At +64, the November Beige Book 2016 reading is now back in the middle of the range it has been in since early 2012. Despite the elevated level of uncertainty surrounding the U.S. presidential election and the outlook for the global economy, optimism on Main Street still reigns. 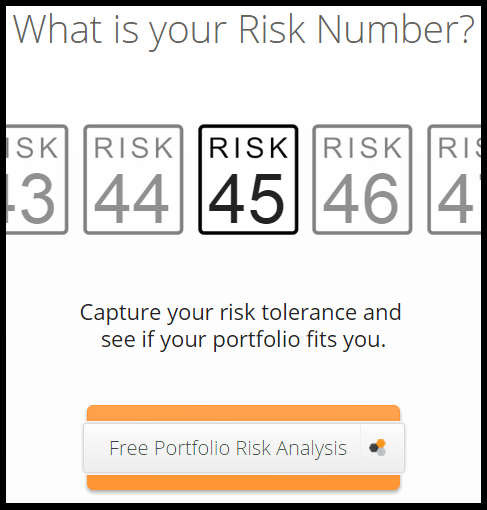 Irrational Exuberance Part 2? Twenty years ago today, Fed President Alan Greenspan gave his now famous Irrational Exuberance speech regarding over-valuations in the equity markets. Today, we examine if we are in another state of irrational exuberance. One concern is valuations are indeed higher than historical norms, although they are by no means near the euphoric levels of the late 1990s. On the fundamental front, the economy continues to show growth consistent with mid cycle, not late cycle. Last, overall market sentiment is showing many more bulls than we saw a month ago, but it still isn’t near the levels of excitement seen at previous market peaks. Santa tends to come late. We all know that December is historically a strong month or equities, with the S&P 500 up 1.6% on average since 1950. Here’s the catch: nearly all the gains tend to happen the second half of the month. Since 1950 on average, the S&P 500 has been flat as of December 15, rallying strongly during the second half of the month. The past 20 years, the S&P 500 has actually been down 0.4% as of mid month, before finishing 1.3% higher on average. Last week’s positive performance across global markets gave investors a chance to catch their breath and retest the waters. U.S. stocks were up with the S&P 500 notching a 2.85 percent gain and the Dow Jones Industrial Average up 2.61 percent. The tech-heavy NASDAQ Composite Index was up just over 3.87 percent. European stocks were also up, posting a positive 1.87 percent as measured by the Stoxx Euro 600 Index. Japanese equities gained 6.8 percent after the Nikkei 225 Index rebounded from heavy selling the week before. U.S. equities posted their first three-day rally of the year and the biggest three-day gain last week since August 2015. While all sectors were up, the energy and financial sectors are still down year-to-date as oil and stubbornly low interest rates continue to weigh on those areas of the market. In fact, the energy and financial sectors are down 6.21 percent and 10.65 percent for 2016, respectively. As the chart below highlights, only the utilities and consumer staples sectors are holding onto positive territory with consumer staples only just so. Will 2016 be another year where a small group of stocks or sectors drive the market’s performance? No one knows for sure but we continue to believe that active management, with a focus on being selective while leveraging secular trends, is still the most prudent way to manage an equity portfolio. The Federal Reserve released the minutes from its most recent meeting last Wednesday allowing investors a glimpse into how one of the world’s most powerful central banks views the economy and global markets. While investors already knew the outcome of the meeting, being able to see details on how the Federal Reserve came to the decision not to raise rates is what markets were focused on last week. More specifically, the Federal Reserve minutes showed officials were struggling to agree on their outlook for inflation and how risks to the economy may materialize. What appeared to drive markets upward was the fact the Federal Reserve gave few clues as to when they will raise rates again indicating rates will likely remain lower for longer. The next meeting for the Fed is March 15-16 and, given their comments from the January meeting, an interest rate increase at that meeting seems more unlikely than ever. As we said in our 2016 outlook, we continue to believe the Federal Reserve’s initial target of 1.25-1.50 percent by year-end would be difficult to achieve. Oil prices were whipsawed this past week as news of a potential production cut pushed prices higher while larger inventory stockpiles weighed on the commodity. Russia, Saudi Arabia, Qatar, and Venezuela met earlier last week and indicated they will cap their output if Iran and Iraq did so as well. While both Iran and Iraq have not confirmed whether they will participate, it is newsworthy that Russia has joined the chorus of those countries seeking to limit production. Russia had previously refused to consider such action. It’s no wonder oil-rich countries are beginning to take these measures. While energy companies must delay investment and lay off workers, countries that largely depend on oil revenue are reeling from the low prices. In fact, Saudi Arabia had a record deficit of almost $98 billion in 2015 and Standard & Poor’s just reduced the country’s credit rating from A+ to A-, citing the long-lasting impact of low oil prices on the economy. In all likelihood, oil volatility will remain elevated as investors await the impact of the agreement on future inventory levels as well as any changes in global demand. It’s easy to think we know almost everything about our planet. Other than the deepest oceans, humans have explored nearly every square mile of every continent and, with the use of satellite photography, this becomes all the easier. Despite this, we still discover amazing natural wonders not previously known to science. In many cases, these are the subject of rumor or shrouded in mystery and distorted over the years as they are passed down through generations. Some of these tall tales turn out to be just that, nothing but fiction used to tell a story. However, there are some that turn out to be true. Up until recently, there was a rumor of a river deep in the Peruvian rainforest that is so hot it can literally boil. Adding to the mystery were cryptic references to the river in old petroleum survey reports dating back to the 1930s. It wasn’t until geoscientists decided to pursue those legends and journey deep into the rainforest to see it with their own eyes. What they discovered was the Mayantuyacu, a natural, 4-mile geothermal stretch of a river that is indeed over 200 degrees Fahrenheit. This is exceptionally amazing in that it would require incredible amounts of heat to boil the river’s flowing water. While there are documented hot springs throughout the Amazon, none are nearly as big as the Mayantuyacu or as far away from the nearest volcano. In fact, the river lays hundreds of miles away from the closest active South American volcano, making it truly a natural wonder. Last week was a busy week in terms of data releases and news. Estimated U.S. gross domestic product (GDP), unemployment data, and the Federal Reserve were just a few headlines that grabbed investors’ attention. U.S. indexes enjoyed another week in the black as domestic indexes surged on Friday. The S&P 500 was up 3.2 percent while the Dow Jones Industrial Average and the NASDAQ were up 3 percent and 2.8 percent, respectively. Internationally, the picture was quite different. The Euro Stoxx 600 index was up 3.77 percent but Chinese equities, as measured by the Shanghai Composite Index, were down 5.63 percent. The job market continues to look strong here in the United States. The most recent release by the Labor Department indicated initial jobless claims fell 16,000 to 278,000. Economists surveyed by The Wall Street Journal were expecting 280,000 claims. Economists pay close attention to the initial jobless claims because, if they are falling, it frequently means less companies are laying employees off and more are hiring. This is typically good for wages which can lead to more consumer spending and domestic growth. More generally, unemployment numbers usually fall during the fourth quarter of the year as temporary hiring picks up for the holidays. The number then tends to rise in the first quarter of the following year as those temporary jobs are no longer needed. GDP slowed in the last quarter of 2015. Economists were expecting 0.8 percent growth but the first estimate of fourth quarter GDP was 0.7 percent. GDP results typically go through a number of revisions as the preliminary estimate includes incomplete data. The final figure can be meaningfully different than the first estimate. According to the results, business inventory investment, personal consumption, and trade were the main detractors. The drop-in trade is likely due to the stronger U.S. dollar and uninspiring global growth while the lagging inventory investment and slowing personal consumption could indicate a decelerating domestic economy. On the positive side, residential investment jumped 8.1 percent in the fourth quarter and, by some measures, the housing market in 2015 was the most robust since the recession. A team of physicists appear to have cracked a significant roadblock in quantum computing, paving the way for quantum computers that can solve “insolvable” problems. If the physicists are correct, then they have solved the causality problem by using quantum particles that are moving along “open timelike curves.” Theoretically, quantum computers using “closed timelike curves” create causality problems. A more practical (or relatable) example of a causality problem takes place in the Back to the Future movie. Since Michael J. Fox’s Marty McFly went back in time and tampered with the past, he almost caused a new future in which he didn’t exist. The same type of problem happens at the particle level, too. With the “open timelike curves,” the physicists hypothesize, as long as they entangle the time-traveling particles with one in the present, they won’t interact with anything in the past, thus preventing causality problems. Think of this as Marty McFly going back in time, still tied to his present-day “self,” and being able to use that information, but not being allowed to speak with his teenage mother and father or interact with anyone else during his trip. According to their report, while these particles never interact, the nature of quantum mechanics and computing still allows for the solving of impossible calculations. Confused? So am I. You have to really hunt to find red in October. October 2015 was a great month for stocks, as the S&P 500 Index rose 8.3% to help take the index from a year- to-date loss of over 9% on August 25, 2015, to a 1% gain as of Friday, October 30, 2015. 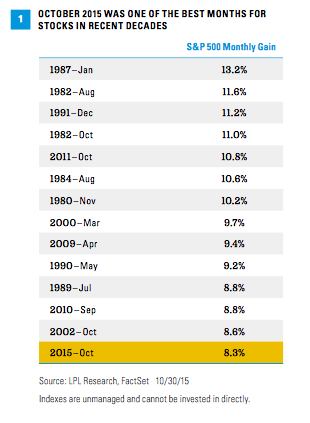 Only 13 months since 1980 have been better, including only 3 Octobers [Figure 1]. The old market adage that October is the month where bear markets go to die held true. But the strong month raises the bar for markets to add to gains over the rest of the year, as higher stock prices have brought higher valuations. It is interesting to note that nearly all of these strong months came during the early or middle parts of bull markets, with March 2000 being the one notable exception. We look ahead at the calendar to identify catalysts that could potentially help stocks add to recent gains. We believe October’s gains were driven primarily by two factors: the market’s increased comfort with China and market-friendly central bank actions. A relatively good start to earnings season and the budget deal in Washington to stave off a nasty debt ceiling debate also helped buoy sentiment. China’s economy is likely growing more slowly than the official gross domestic product (GDP) statistics, although the reliable Chinese data we have suggest growth is stabilizing. The sixth interest rate cut in the past year by the People’s Bank of China (China’s central bank) and other stimulus initiatives have added to the market’s confidence that China would avoid a hard landing (see our latest Thought Leadership piece on China). Central bank activities in the U.S. and Europe also helped drive stocks higher in October. In the U.S. for much of October, stocks benefited from the pushout of market expectations for Federal Reserve (Fed) rate hikes into early 2016. Stocks held their monthly gains after the Fed removed the portion of its policy statement about overseas growth concerns, even though the odds of a December rate hike increased (based on fed fund futures). Optimism about more stimulus from the European Central Bank (ECB) also helped boost U.S. stocks in late October. Just because October was a big month does not necessarily mean that stocks will pull back between now and the end of the year. Since 1980, the S&P 500 has been up an average of 1.2% with gains 50% of the time in the two months following a calendar month gain of over 8%. That small potential gain, coupled with dividends, could potentially get the S&P 500 to the low end of our 5–9% total return forecast for 2015.
experienced after the Fed begins to hike rates. * The market may like getting the first hike out of the way, especially considering the implied positive growth message. That said, we recognize that the first Fed rate hike of an economic cycle has driven stock market volatility in the past (though usually short lived), so this date is a risk as much as a potential catalyst. Also worth noting, Fed Chair Janet Yellen will speak on November 4, 2015, before the Financial Services Committee of the U.S. House of Representatives, and before the Economic Club of Washington on December 2, 2015. Fed Vice Chair Stanley Fischer will speak to the Economic Club of Washington on November 4, 2015. These events may provide insights into the path of future Fed policy and could act as secondary catalysts. We believe the Fed is still very much on the fence about whether to hike rates in December or to wait until early 2016. The two jobs reports will go a long way toward determining whether the Fed hikes rates at its next meeting in December. Recall the September jobs report was soft, with just 142,000 net new jobs created for the month (below the 2015 trend of around 200,000), although the unemployment rate held steady at 5.1%. OPEC will hold its biannual meeting on December 4. Oil has become more important for financial markets, as the drop in oil prices has significantly impacted overall corporate profits, capital spending, emerging market economies, and credit markets. While the status quo is the most likely scenario, it is possible that stocks may get some help from a reduction in OPEC’s production target and a subsequent bump up in oil. Saudi Arabia is in control and seems intent on preserving market share, but could try to talk up prices to help the smaller players without meaningfully altering its own production. The government’s retail sales date for November, to be released on December 11, include the first month of the all-important holiday shopping season. For many retailers and tech gadget makers, more than half of their sales for the year come during the peak holiday shopping season (November and December). The consumer has been the key driver of U.S. economic growth—consumer spending rose at a 3.2% annualized pace during the third quarter, compared to overall GDP growth of just 1.5%. Based on recent sales trends and strong consumer balance sheets, we expect holiday shopping sales totals to grow roughly in-line with the National Retail Federation’s forecast of 3.7% in 2015. Holiday shopping may not be a big potential positive catalyst, but we do not expect it to be a drag either. Central Banks coaxed the equity markets higher yet again this week. 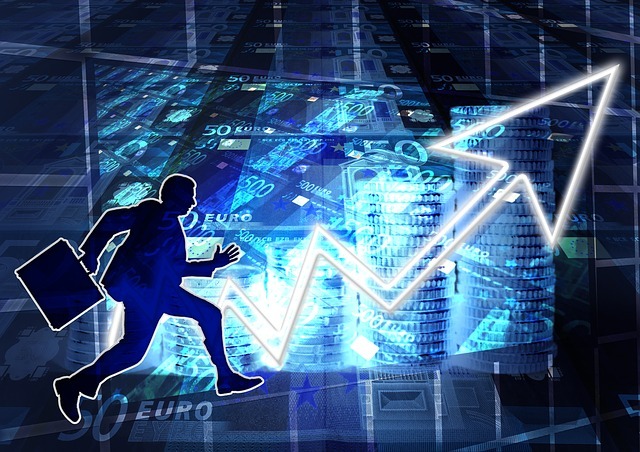 Hints of more easing from the European Central Bank (ECB) and a surprise rate cut by the Bank of China pushed stocks higher in the back half of the week. It also didn’t hurt that earnings reports from large technology companies beat expectations. The S&P 500 finished last week 2.1 percent higher, its fourth consecutive weekly gain. The Dow Jones Industrial Average rose 2.5 percent, and the technology heavy NASDAQ Composite jumped 3 percent. A pair of central banks boosted equity markets this past week. First, the ECB President, Mario Draghi, hinted that more stimulus could be coming when that central bank reexamines its current policy in December. The ECB is currently purchasing 60 billion euros worth of bonds each month. This sent European equity markets to their highest point since August and pushed yields on the German ten-year note below 50 basis points. The euro also sank nearly 2 percent to $1.11 on the news. Then, on Friday the Central Bank of China announced a quarter-point cut in its benchmark interest rate as well as a 50 basis point reduction in reserve requirement ratios for banks. This was the sixth time since November 2014 that the Chinese central bank cut interest rates. The National Association of Realtors recently announced existing home sales rose 4.7 percent for the month of September to an annual rate of 5.5 million. 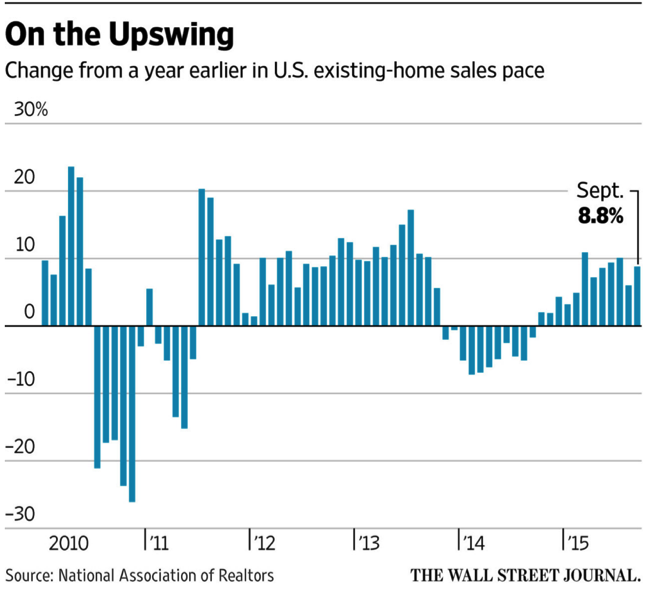 The September figure puts us on pace for the best year for existing home sales since the housing crisis. The increased activity appears to be driven by job growth, low rates, and pent-up demand given years of low new household formations. However, the robust report did show some cracks. Primarily, the reduction in the percentage of first-time home buyers. First-time buyers represented just 29 percent of purchases in the month, down from 32 percent in August. A reduction in this source of new demand could foreshadow a slowdown in the coming months. This is largely the result of home prices rising faster than incomes. The median home price for September rose more than 6 percent year-over-year, compared to just 2 percent income growth. 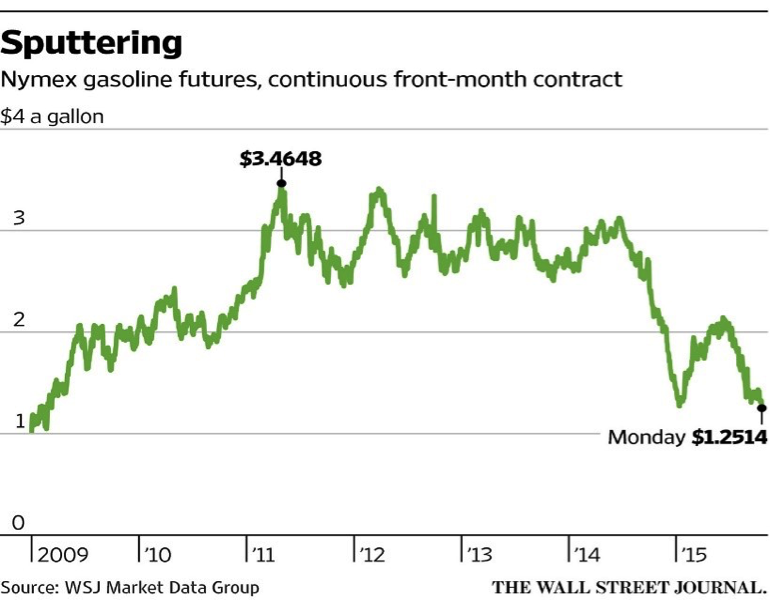 Gasoline futures have dipped 10 percent so far in October capping off a collapse to a six-year low. The decline stems from further increases in supply. According to the Energy Information Administration, gasoline inventories stood at 221 million barrels at the end of the first week of October. This is the highest level for this time of year since 1990. On top of the increased supply is the seasonal effect where refineries begin ramping production of heating oil, which produces gasoline as a byproduct. This is causing some forecasters to call for gasoline prices to fall below $2 per gallon this winter. However, domestic demand is expected to remain strong, which may keep prices elevated. The United States now uses more than nine million barrels of gasoline a day, the highest level for this time of year since 2009. For most people, completing a marathon is, in and of itself, a major accomplishment. However, Steve Bergstrom went above and beyond during this year’s Chicago marathon by finishing in less than four hours and receiving twelve date requests in the process. The recently-single marketing professional decided to run the marathon shirtless with a simple message, written with a marker, onto his back: SINGLE/on Facebook/Steve Bergstrom. The runner thought he would have a better time finding a suitable mate during the marathon since he spends hours a week training. Even in a world of social media and online banner ads, some of the best marketing can still be done with a little creativity and pen. Sharp swings in the currency markets have taken their toll on overall global wealth, shrinking it for the first time since the global financial crisis. But while the overall pool of cash has declined, the gap between rich and poor has widened, with the top 1 percent of global wealth holders now in possession of 50 percent of all household assets in the world, according to the annual Credit Suisse global wealth report. Total wealth has doubled since 2000, with a fivefold rise in China and lower, but still rapid, growth in India according to the research. “Wealth inequality changes slowly over time, so it is difficult to identify the drivers of these trends. However, the value of financial assets – especially company securities – is likely to be an important factor because wealthier individuals hold a disproportionate share of their assets in financial form,” the report found. Total global wealth decreased by $12.4 trillion to $250.1 trillion, with the strength of the U.S. dollar weighing on the overall global wealth picture, as when valued in U.S. dollars, net worth fell in every region except China and North America. The decline is the first time global household wealth has fallen since the economic crisis of 2007-2008, but when stripping out currency headwinds the underlying trend points to net worth growing every year this century, apart from the financial crisis period, the report found. This dip in overall wealth also hit the number of millionaires, which having climbed from 13.7 million at the turn of the century to 36.1 million in 2014, fell back this year to 33.7 million due to exchange rate effects. “The rise of 146 percent (in millionaires) since 2000 reflects population growth and the fact that inflation progressively lowers the bar for membership of the millionaire club. Nevertheless, the number of millionaires has still grown significantly after discounting for these factors,” the report authors said. The U.S. tops the list of countries with wealth rises again, with an increase of $4.6 trillion, falling way short of the $9 billion gained the year before but “substantial” in the global context, according to Credit Suisse. Wealth also increased in China by a significant $1.5 trillion and in the U.K. by $360 billion. No other country gained more than $100 billion while wealth fell by $100 billion or more in 27 countries and in excess of $500 billion in nine countries. Some of these bigger fallers, including France, Germany, Italy and Spain – were euro zone countries which exchange rate fluctuations had worked in their favor a year ago. Australia and Canada also shed more than $1.5 trillion between them and wealth fell substantially again in Japan, this time by $3.5 trillion. Well, third quarter was a humdinger. It began with the first International Monetary Fund (IMF) default by a developed country (Greece) and finished with Hurricane Joaquin possibly headed toward the east coast. In between, China’s stock market tumbled, the Federal Reserve tried to interpret conflicting signals, and trade growth slowed globally. After such a stressful quarter, we may see an uptick in the quantity of alcoholic beverages consumed per person around the world. That number had declined (along with economic growth in China) between 2012 and 2014, according to The Economist. Despite defaulting on its IMF loan, rejecting a multi-billion-euro bailout plan, and closing its banks for more than two weeks, Greece was not forced out of the Eurozone. Instead, Europe cooked up a deal that left the IMF unhappy and analysts shaking their heads. The Economist reported the new deal for Greece was an exercise in wishful thinking. The problem is the deal relies on “the same old recipe of austerity and implausible assumptions. The IMF is supposed to be financing part of the bailout. Even it thinks the deal makes no sense.” It’s a recipe we’re familiar with in the United States: When in doubt, defer the problem to the future. That statistical sleight of hand implies China experienced deflation early in the year. It did not. On a related note, from mid-June through the end of the third quarter, the Shenzhen Stock Exchange Composite Index fell from 3,140 to about 1,716, according to BloombergBusiness. That’s about a 45 percent decline in value. Green light: employment numbers. Red light: consumer prices, inflation expectations, wages, and global growth. Late in the quarter, the Federal Reserve decided not to begin tightening monetary policy. According to Reuters, voting members of the Federal Open Market Committee (FOMC) decided uncertainty in global markets had the potential to negatively affect domestic economic strength. They may have been right. The Wall Street Journal reported, although unemployment remained at 5.1 percent, just 142,000 jobs were added in September. That was significantly below economists’ expectations that 200,000 jobs would be created. The Journal suggested the labor market has downshifted after 18 months of solid jobs creation. The global economy isn’t as robust as many expected it to be. According to the Business Standard, the World Trade Organization (WTO) lowered its forecast for global trade growth during 2015 from 3.3 percent to 2.8 percent. Falling demand for imports in developing nations and low commodity prices are translating into less global trade. Expectations are trade growth will be 3.9 percent in 2016, which could help support global economic growth.